In 1818, British obstetrician James Blundell performed the first human-to-human blood transfusion. 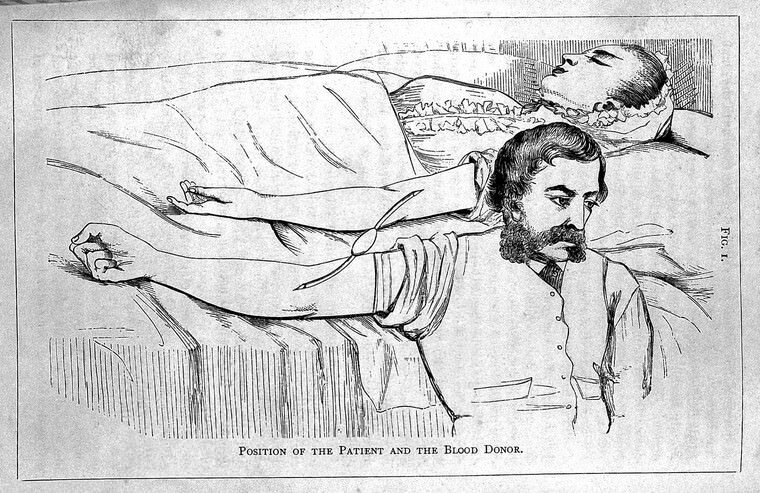 Although the patient died, Blundell’s transfusion experiments, and his certainty that human patients required human blood, led to advances in transfusion medicine that continue into the present. Here’s a bit of blood transfusion history. There’s even a Bonaparte connection. 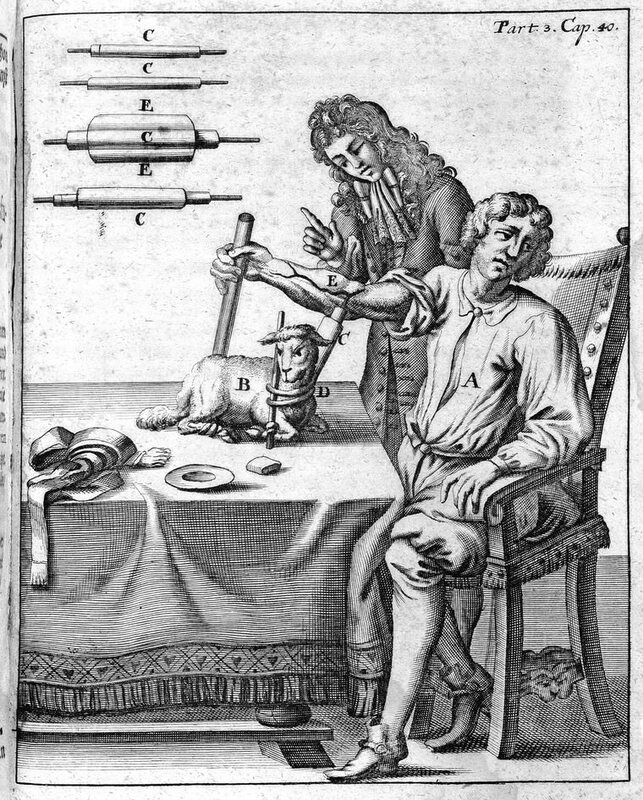 Although the idea of reviving someone by injecting blood into their veins goes back to the ancients, the first successful blood transfusion was not performed until the 17th century. The story that Pope Innocent VIII was transfused on his deathbed in 1492 with the blood of three young boys is a myth. (2) It required English physician William Harvey’s discovery of how blood circulates continuously throughout the body – announced in 1616 and published in 1628 – to make blood transfusion a serious prospect. Prior to Harvey’s discovery, physicians generally believed that the veins were separate from the arteries, and that venous blood originated in the liver, while arterial blood flowed from the heart. When reports of the English experiments reached Paris, French scientists began their own transfusion trials. 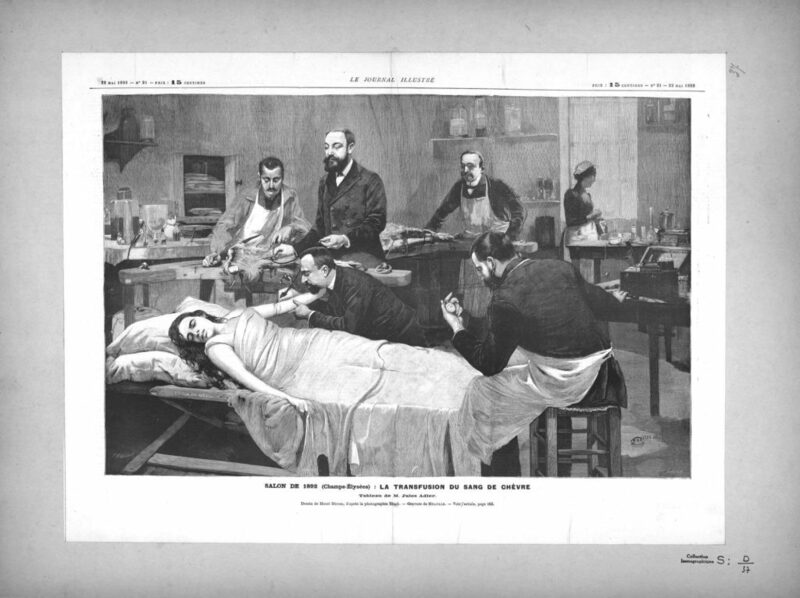 The first successful human blood transfusion was performed in France on June 15, 1667. Jean-Baptiste Denis, a physician to King Louis XIV, transfused blood from the carotid artery of a lamb into the vein of a 15 or 16-year-old boy, who had suffered for a fever for many months and had been bled by his physicians 20 times, thus falling into “great debility and drowsiness.” (5) The boy survived the transfusion, thanks probably to the small amount of blood that he was actually given. A few days later Denis transfused sheep’s blood into a 45-year-old labourer, who also survived. Coga, who reportedly spent his 20 shillings on alcohol, demanded the same amount for his second transfusion. This took place successfully on December 12, 1667, before a large crowd. Coga declined a third transfusion. In France, Denis continued his experiments less successfully. Swedish nobleman Gustaf Bonde died after a second transfusion of calf’s blood. A 34-year-old house servant named Antoine Mauroy survived a first transfusion of calf’s blood, but developed a hemolytic reaction after a second transfusion. He died during a third transfusion on December 19, 1667. Mauroy’s wife accused Denis of killing her husband. When Denis brought the case to court in self-defence, he was cleared of wrongdoing. However, the case resulted in blood transfusion being prohibited by law in France in 1678. The Royal Society in London also abolished the practice and the Pope banned it. As a result, there was little further experimentation with transfusion until the early 19th century. Blundell concluded that human blood was required for human transfusion. “[Blood] if taken indifferently from animals, and injected in large quantities, is fatal.” In addition, it was impractical to count on the availability of animal blood in an emergency. On September 26, 1818, at Guy’s Hospital in London, Blundell attempted the first documented human-to-human blood transfusion. The recipient was a man named Brazier, between 30 and 40 years old, who was suffering from a tumor in his stomach and had lost a considerable amount of blood. The donors were drawn from among the three physicians, five surgeons and other gentlemen in attendance. An ounce and a half of blood was taken by syringe and immediately injected into Brazier’s vein. The procedure was repeated 10 times during the course of 30-40 minutes. At the first the patient showed signs of improvement, but then he declined. Brazier died on the third day after his transfusion. Blundell subsequently transfused five other patients, all of whom died. The indications for transfusion included postpartum hemorrhage, extreme malnutrition, puerperal fever, a ruptured uterus, and hydrophobia. Since each patient was critically ill, it is impossible to know whether the transfusion contributed to their death. States of the body really requiring the infusion of blood into the veins are probably rare; yet we sometimes meet with cases in which the patient must die unless such operation can be performed; and still more frequently with cases which seem to require a supply of blood, in order to prevent the ill health which usually arises from large losses of the vital fluid, even when they do not prove fatal. Sadly, Joseph’s daughter Charlotte died of hemorrhage after childbirth in 1839. She did not receive a transfusion. The complications of transfusion and difficulties in obtaining blood led to a search for safer and more readily available substitutes. Saline – first infused intravenously by Dr. Thomas Latta for the treatment of cholera in 1832 – became another popular blood substitute in the latter part of the 19th century. Its infusion was observed to be safer than, and frequently as effective as, blood transfusion. After 1875, transfusion became used for a wider range of indications, and the number of severe adverse reactions and fatalities increased. Also, although it was evident that transfusions within the same species were more effective than transfusions between different species, animal-to-human transfusions continued to be performed until at least 1890. In 1900, Austrian immunologist Karl Landsteiner discovered the ABO blood groups. He also found that transfusion between persons with different blood groups resulted in the destruction of red blood cells in the recipient. Based on Landsteiner’s findings, American hematologist Reuben Ottenberg performed the first successful ABO-matched human-to-human transfusion at Mount Sinai Hospital in New York. In 1913, Richard Lewisohn, a German-American surgeon at Mount Sinai Hospital, used sodium citrate to prevent donated blood from clotting. This, combined with refrigeration, enabled blood to be collected and stored, rather than having to be donated at the time of the transfusion. In 1937, Landsteiner and Alexander Wiener discovered the Rhesus (Rh) factor, another blood group system, which further increased the ability to match compatible donors with recipients and thus reduce adverse reactions. Further advances, including the identification of more blood group systems, improvements in blood storage, the separation of plasma into therapeutic components, infectious disease testing, and improved screening of blood donors, continued throughout the 20th century and into the 21st, making transfusion therapy safe, effective and widely available. Brookes More, Ovid’s Metamorphoses, Vol. I (Francestown, NH, 1978), p. 249. A. Lindeboom, “The Story of a Blood Transfusion to a Pope,” Journal of the History of Medicine and Allied Sciences, Vol. IX, No. 4 (October 1954), pp. 455-459; A. Matthew Gottlieb, “History of the First Blood Transfusion but a Fable Agreed Upon: The Transfusion of Blood to a Pope,” Transfusion Medicine Reviews, Vol. V, No. 3 (July 1991), pp. 228-235. Charles Hutton, George Shaw, Richard Pearson, The Philosophical Transactions of the Royal Society of London, From Their Commencement, in 1665, to the Year 1800, Vol. I (London, 1809), p. 131. Robert Latham, ed., The Shorter Pepys (London, 1985), p. 692. Latham, The Shorter Pepys, pp. 849-850. James Blundell, Researches Physiological and Pathological; Instituted Principally With a View to the Improvement of Medical and Surgical Practice (London, 1824), pp. 81-82. James Blundell, “Lectures on the Theory and Practice of Midwifery,” The Lancet, 1827-28, Vol. I (London, 1828), p. 677. Blundell, Researches Physiological and Pathological, p. 116. The London Medical and Surgical Journal, Vol. I (London, 1828), p. 173. James Blundell, “Observations on the Transfusion of Blood,” The Lancet, 1828-29, Vol. II (London, 1829), p. 321. Blundell, Researches Physiological and Pathological, p. 123. Georges Bertin, Joseph Bonaparte en Amérique: 1815-1832 (Paris, 1893), p. 356. Edward M. Hodder, “Transfusion of Milk in Cholera,” The Retrospect of Medicine: Being a Half-Yearly Journal, Vol. 67 (London, 1873), pp. 15-16. Charles Egerton Jennings, Transfusion: Its History, Indications, and Modes of Application (London, 1883), p. 19. Your essay is very interesting. It lays out how blood transfusion was used by physicians long before it was properly understood and made safe and effective. I had no idea the practice went as far back as it did. Thanks, John. 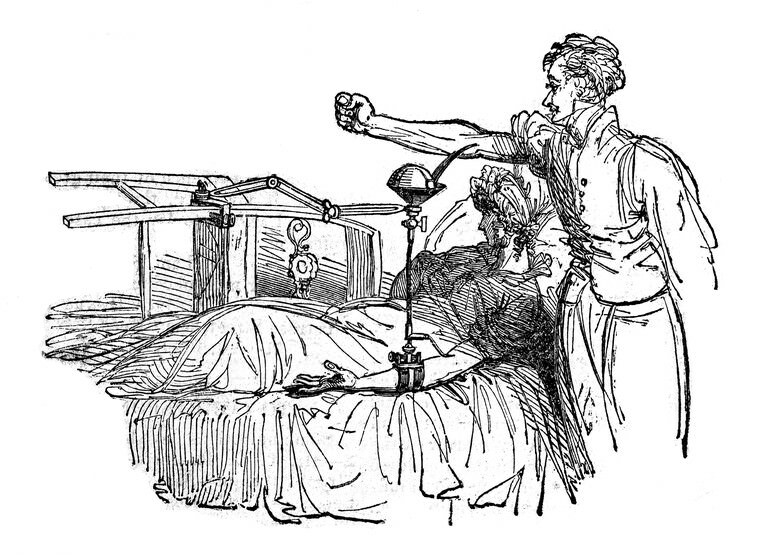 That’s interesting about “Dracula.” I read one analysis that suggested Mary Shelley’s “Frankenstein” was also influenced by Blundell’s transfusion experiments (the spark of life idea). Very interesting – Have a great day! Very interesting! Certainly the discovery of rh factors must have been a great step forward. Thanks! Thanks for pointing me to Dr. Fitzharris’s book, Louise. Joseph Lister’s use of antiseptics to control infection certainly helped make transfusions less dangerous. Have a great day yourself! How very true, Marie-Noëlle. Bloodletting was still a common medical treatment, persisting even in the early 20th century. Thanks, Randy. Yes, the Rh discovery was particularly helpful, especially in enabling prevention and treatment of hemolytic disease of the newborn. I became fascinated in the history of blood transfusions when my blog partner, a medico, gave me a pile of journal articles. But I did not mention the issue of animal-to-human transfusions. So I am grateful for the link. 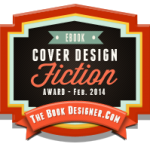 Many thanks for the link, Hels! Excellent article, and a great complement to this one, particularly as you go into more details on the late-19th and 20th century advances, and the use of transfusion in war. 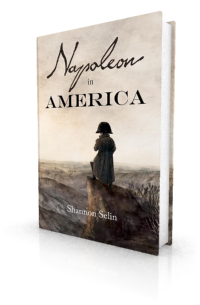 Absolutely fascinating, if a little stomach-churning. Thanks, April. I must admit, I felt queasy reading about some of the experiments. Thanks for the article. It was an interesting read, and I’m not even in the medical profession. You’re welcome, James. I’m glad you found it interesting. According to an article by T.F. Baskett in ACOG Clinical Review (March/April 1998), the first successful exchange transfusion for hemolytic disease of the newborn was conducted on December 18, 1924 by Dr. Alfred Hart at the Toronto Hospital for Sick Children: https://www.sciencedirect.com/science/article/pii/S1085686297000526. Dr. Hart was lucky in his choice of donor, as that was before Drs. Weiner and Landsteiner discovered the Rh factor (1937). You must have been one of the early successful exchange transfusions after that discovery, Gary. 2018 marks the 200 years since the first human-to-human blood transfusion!! Persons may be induced occasionally, sometimes from motives of affection, and sometimes for hire, to submit to the opening of an artery.